The 1945 Roald Dahl short-story classic involving but not limited to a turtle, a yogi, and a terrible swan song. It begins with the spooky and brief story of a boy who rescues a turtle from a terrible death, moves on to a delightful tale of a speeder and a pickpocket, shifts to a story of a trove of Roman silver uncovered in an English field, moves to "The Swan," one of the most terrifying stories about bullying ever written, segues into the fantastical title story about an Englishman who learns to see without his eyes, then takes a break for Dahl to talk about how he became a writer (he invented the word "Gremlin" and hung out with FDR!) before presenting the first thing he's ever published-an account being shot down over North Africa during WWII. But for all that the collection could seem scattershot, it is not-because it is held firmly together by Dahl's enduring theme: The terrible power of the thick-headed bully, and the transcendence of knowledge and kindness in the face of meaningless cruelty. Common to horror writers is this pitched battle of the good against the innocent, the moment of quivering uncertainty when we don't know yet whether something terrible is going to happen and won't be able to stand it either way. But what's particular to Dahl, and what I'd forgotten, is how much he associates evil with eating. Because, whether it's to chop up a turtle alive during Waterloo for a dinner course of soup, kill and hack apart a swan for play, or simply greedily hoard silver a stash of wondrous silver, evil in Dahl is associated with overfeeding, and if you need to know who the bullies are, look for close-set, glittering eyes; fleshy lips and a wet, open mouth; meaty arms and thighs; nuts stuck in teeth, or simply the overly oiled who seek only to pamper and increase their flesh. A Freudian might point out-and might manage to actually be right-that Dahl's linking of evil bullies to food might easily be traced back to the days when he could be caned for leaving a burnt spot on a slice of bread. And in each story there is that horrible moment of non-control and terror when the turtle caught; when the swan is actually shot; the siren goes off; the yogi dies; the silver stolen outright. But Dahl, for all that horror, is an absurd optimist, who always allows the good to prevail. (My personal favorite revenge on the greedy comes from his story "Lamb to the Slaughter", in which – spoiler – a woman kills her husband with a large frozen lamb, then feeds it to the policemen investigating the crime.) Without exception, the persecuted simply swim, fly, drive, or otherwise slip the grasp of the cruel world. Even Henry Sugar, who's only held back by his own greedy proclivities, winds up a globe-hopper creating homes for the fellow homeless orphans. Each reader will forever keep the image that stays with her of how they've escaped the grasp of the gobblers of life. (Mine is always Peter from "The Swan" not flying away, but moving his head back and forth to gently make enough of a depression in the train tracks to not be killed when it passes over him. 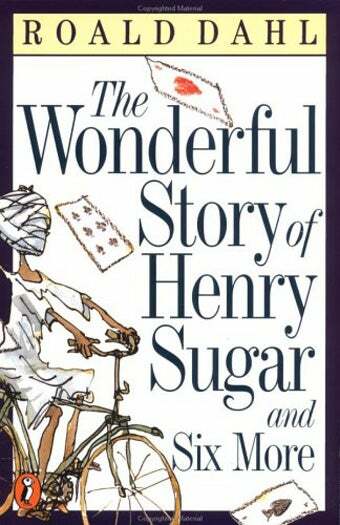 But what Henry Sugar reminds us is that although the world is ruled by the senses, there is more shoot or be shot, cane or be caned, eat or be eaten. While the greedy try to eat it all up, the good see right through them. Hello pretties! Very brief Plotfinder this week from a friend who IS DESPERATE to know. The only detail she remembers is that a black girl is told to put butter in her hair to calm it, and, lacking butter, uses ghee. Takers? I remember using butter as lotion which makes your hands smell rancid (Flowers, yes?) but am clueless on this one. Answer in comments below or send to jezziefinelines@gmail.com. Winner gets FREE COPY. Also have to relate brief story of what happened to me this morning, JUST BECAUSE I LOVE IT. I live in Jersey City and travel out of Newark Penn station 900 times a month to various places, supporting Amtrak as is my way. (I love trains.) The other day I was in Hudson Booksellers and started chatting with the clerk, and, since it was almost exactly the pub date of my book, told her all about it, and also that I would bring her a card and a copy the next week when I returned. So TODAY, I go in, w/card, and it turned out SHE'D ALREADY ORDERED IT AND THERE IT WAS ON THE SHELVES! Since I discovered Roald Dahl en route (and contributor Jennifer Weiner, for what that's worth) I urge you — if you are in a place of transit and see a bookseller and you feel like it, tell them about this book! They seem like they'll order pretty much anything.